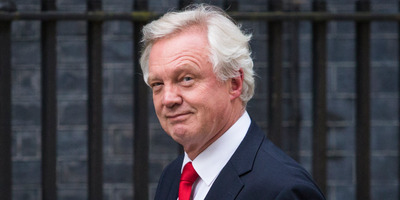 Jack Taylor/Getty ImagesBrexit Secretary David Davis. The UK government is reportedly considering keeping its borders completely open to the EU if there is no deal. Theresa May and co are prepared to employ the “Throw Open the Borders option” to protect Britain from costly tariff and non-tariff barriers. The EU would have to break its own law in order to comply with the proposal. LONDON – The UK government is reportedly considering making Britain’s borders completely open to the European Union after Brexit if it crashes out of negotiations with no deal in place. Earlier this week it was reported the government had signed “many dozens” of non-disclosure agreements with firms which operate on Britain’s borders, prohibiting them from disclosing how Brexit could impact cross-border trade. The greatest fear for British industries which export to the EU is a no-deal Brexit. In that scenario, Britain would leave the single market and customs union with no UK-EU free trade deal in place, and default to WTO trading rules. Experts have warned that this “hard” form of Brexit would unleash an array of costly tariff and non-tariff barriers on British businesses and lead to additional checks at Britain’s borders. However, one of the options Theresa May’s government is weighing up for a no-deal scenario is a ‘Throw Open the Borders option,”Sky News reports on Friday. This would involve Britain unilaterally deciding not to impose checks on the border and allow goods to continue moving into the country as freely as they do currently. The idea would hinge on the unlikely event of France, Belgium and Ireland – the EU member states with channel crossings to Britain – refusing to impose strict EU law which states third countries must be subject to tariffs and standard checks. “Disruption in Europe trying to get to Britain is just as much of a problem as disruption here,” Christopher Snelling of the Freight Transport Association told Sky News. Labour MP and supporter of anti-hard Brexit group, Chuka Umunna, described the reported proposal as “extraordinary” in a statement sent to Business Insider. “What signal does it send to anyone considering a trade deal with Britain? Who will be willing to make a deal with a country that says it is its policy not to enforce international law? “And what would it mean for safety and security? The prospect of leaving the EU has already opened up opportunities for smugglers to make money out of differing tax and duty rates: making it clear we won’t even try to enforce the law threatens to give smugglers a free hand,” he said. Transport Secretary Chis Grayling last night insisted there will be no additional checks on Britain’s border no matter what form Brexit takes. “We will maintain a free-flowing border at Dover, we will not impose checks at the port, it is utterly unrealistic to do so,” the Brexit-voting Conservative minister told audience members. WATCH: On #BBCQT last night, Chris Grayling made the startling admission that the Gov just won't bother checking trucks coming into Dover post-Brexit. Grayling’s claim put him at odds with the overwhelming majority of academics and industry leaders, who say international law means there will be at least some additional checks on Britain’s borders after Brexit. This is because leaving the customs union will end the universal tariff-free trade of goods and services between the UK and EU while leaving the single market will create new standard and compliance checks for goods crossing the border.